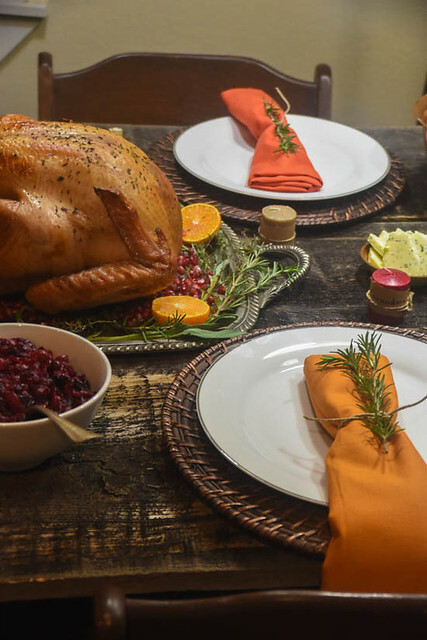 There is enough going on with Thanksgiving food alone to overwhelm someone. Here are a few of our simple ideas for fuss free decorating. Use bright colored fruits and herbs to decorate platters and garnish dishes. 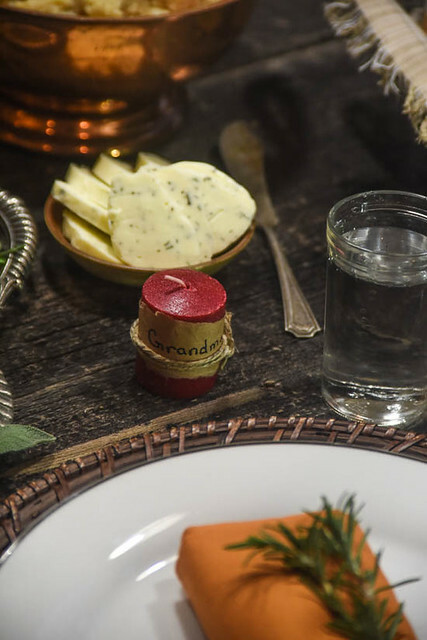 Serve things in vintage baskets and rustic linens. Search for special pieces at antique shops. Look for smaller items here like special silverware, salt and pepper shakers or small bowls since the prices are higher. But if you find that perfect piece that is a bit more expensive don’t be afraid to splurge on it if it is something that is able to be used at every holiday or (better!) incorporated into your everyday life. I don’t tend to splurge on big ticket items that will only be used once a year. Buy fabric instead of linens. I have gobs of napkins but that is because I buy 1/4-1/2 a yard of fabric and make 2-4 napkins out of that amount of fabric. 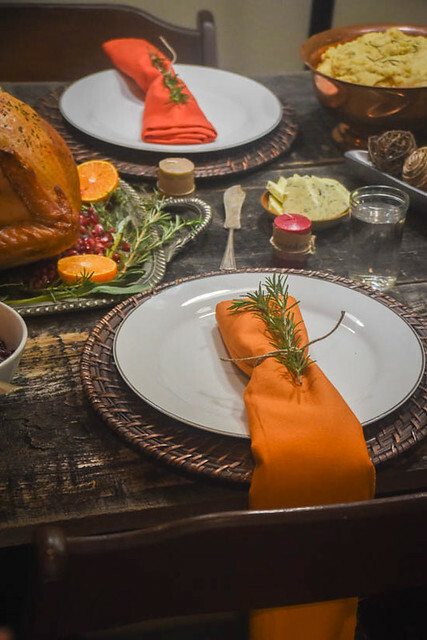 A table runner and napkins can be made from just a bit under 2 yards for the average table. A quick hemming on your sewing machine and you are good to go for 1/4 of the price. Pretty decorative balls like these. You can make a ton of different decor things with just these few basics. 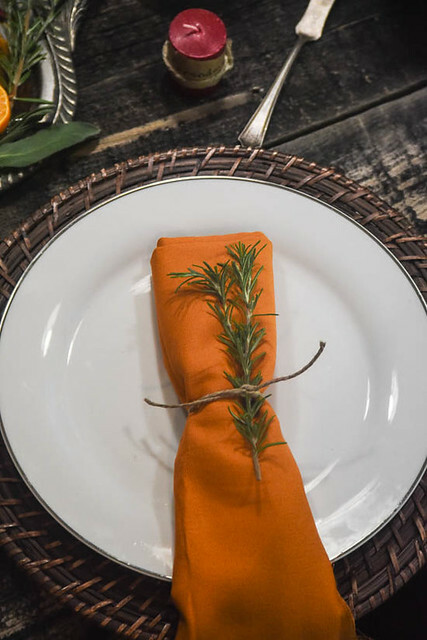 Literally all I did for these beautiful napkins is wrap some twine around the napkins and tuck in individual stems of rosemary. Can’t get much easier than that! For these adorable little place cards/take home gifts I snagged some .50 cent candles, tore off a strip of brown paper bag and wrapped it around the candle with twine. A sharpie and 10 seconds later we have a perfect place setting! I love this long skinny bowl that I found at goodwill for $3 and its perfect for when you need a little something without taking up half a table. Dump in the balls and leave it up until Christmas! 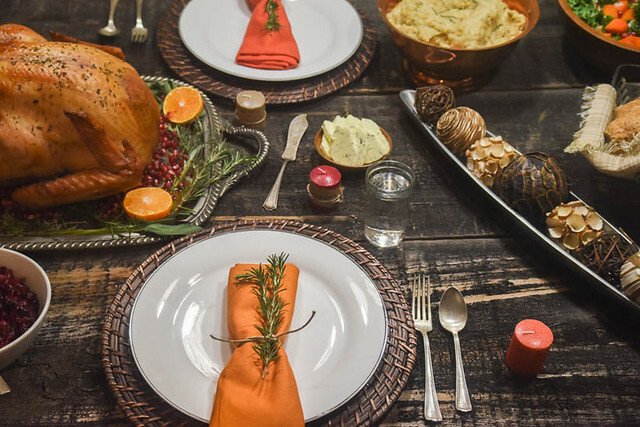 I hope these ideas have helped you see how easy it is to make your table setting look like stunning in just a few minutes and with very basic supplies! Happy Thanksgiving from The Meyers! !